This Great Graphic comes from the CME. We tend not to see the increase in the yuan’s deposits in Hong Kong as the same as its internationalization. After all, Hong Kong is part of China and is just as much, we have argued of the Sino-ification of Hong Kong. At the same, time, the graphic shows a stabilisation of the yuan on deposit in Hong Kong. That said, there the ability to use the yuan in Hong Kong (CNH) for on-short investments is gradually increasing amid mild liberalization steps. 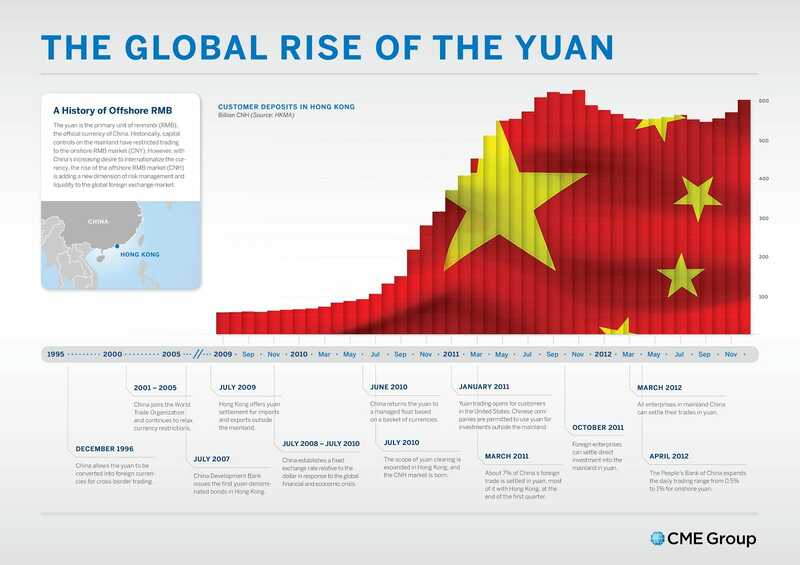 In terms of a reserve asset, the Chinese yuan is almost non-existent. To the extent central banks have diversified away from the dollar and euro, they have moved toward the Canadian and Australian dollars, not the yuan.